VirtualBox Review 2019: Is VirtualBox a Good Hosting? Virtualbox is a top Israeli hosting company that offers reliable hosting solutions to owners of small and medium-sized websites. They not only use the latest hardware and licensed software, but also offer high-level support to customers. Founded in 2011, Virtualbox is a boutique web hosting company that also provides cloud storage solutions and dedicated servers at pocket-friendly rates. Virtualbox offers good hosting packages with various features. Starter hosting runs on Windows 2008 Servers with Dual Xeon Quad Core processors. With 16 GB – 32 GB RAM and RAID 10 disk array, you get a server that’s capable of handling a significant workload. All their hosting packages support the latest scripting languages such as ASP.NET 4, PHP 5+, and MVC. With full support for MySQL 5.5, you can build database-driven sites quickly. Designed and built with performance and reliability in mind, their infrastructure and redundant network guarantees 99.9% uptime. Daily back-ups and full protection against DDoS attacks ensure continuity in operation. In the event of a disaster or malicious cyber-attacks against your servers, backup components will be deployed to maintain service availability. If you require dedicated resources, there’s no better option than their range of IBM Xseries dedicated servers with RAID storage. Built for performance, they can meet your demands for maximum speed and unmetered bandwidth for transfers or heavy workloads. They’re not only secure and stable, but they also give you full control to all components of your physical servers and web resources. Cloud hosting is the other option on the table. It’s suitable for customers who want reliable hosting solutions and services minus the stress and cost of managing their servers. Their services are fully managed. With their Cloud solutions, you will enjoy maximum speed, high-level support, and still have room for expansion. Virtualbox has a management interface that’s functional. It gives you just about everything you need to manage your account. When it comes to navigation, I can tell you that I have seen much better websites. I really wish they had an English version of the site for international customers. I also found the ordering process to be quite long and unclear. While other hosting services let you place an order and check out online, Virtualbox requires you to download, fill, and submit order requests for their hosting services. They seriously need to rethink and simplify the ordering process. That notwithstanding, they’ve done a good job if highlighting hosting and email features. So you won’t have to guess what’s included with your package. With Virtualbox, you get zero-liability hosting and flexible plans with a good number of features. I have compared their online storage solutions with other local and international hosts and I can say it’s one of the cheapest in the market. Customers get full access to licensed software, web-based emails, and open source tools at no extra cost. Virtualbox offers scalable hosting packages. As your business grows, you can increase the disk space volume, transfer bandwidth, IP addresses, and databases. For a small fee, you can also order low cost email storage to supplement their free web-based email service. Technical support is available to customers 24 hours a day. Their support team comprises friendly and responsive professionals with plenty of experience in various aspects of shared web hosting, domain management, VPS, and Cloud hosting. What I like about them is that they handle cases promptly and resolve issues in a satisfactory manner. You can reach out to them directly on telephone, send a fax, or shoot an email. 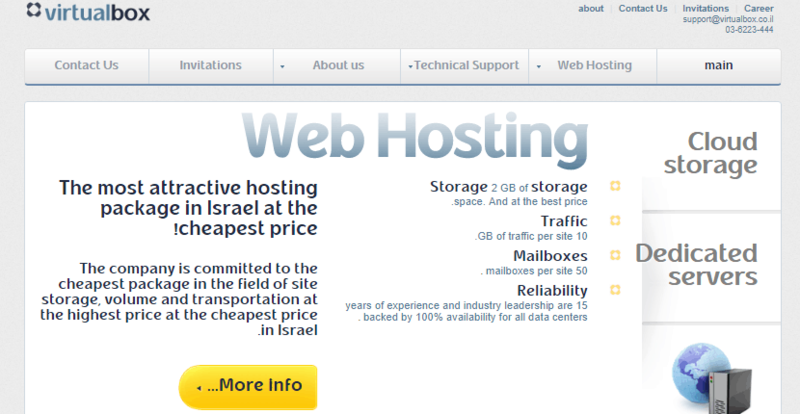 Virtualbox is a good choice for customers who are looking for a top hosting service in Israel. They have reliable infrastructure, attractive hosting packages, and 15 years of web hosting experience. Wondering how VirtualBox stacks up against other Web Hosting companies? Enter any other Web Hosting company and we will give you a side-by-side comparison.